I think that any tough Minoan farmer would be very surprised to learn that he had only a ‘tenuous mastery’ over his bulls. It’s more likely that bull-leaping was a profit-center for the priesthood and bull-sacrifice was a carefully regulated release of high-quality protein into part or all of the community. (Roy Rappoport, Pigs for the Ancestors, 1958, rep. 1984) But these, too, are guesses. What we need for the ancient world is not a tiresome and laborious re-hashing of commonly-accepted ideas. We don’t need an ever more nuanced interpretation of their myths. What we need is an anthropology .. a real anthropology … one that begins with a deep understanding of their agricultural year and how they related to their land. There IS such a thing as anthropology and it’s time that its insights made head-way in the areas of (en faut de meilleur) intellectual history . Did rhytons hold bull’s blood? Don’t know. Why would celebrants pour blood? Not sure. What would they pour it on? Don’t know that either. Did people leap over bulls? Yeah, pretty sure. Why would they do that? Maybe to impress girls? It’s, like, cosmological, man. And I suggest that McInerny re-think his idea that a wine vessel, weighing 6.6 lbs. when full, is too heavy to be a drinking vessel. They may not do that at the Dean’s soiree but any frat brother could clue him in. Hi Bob! Thanks for your thoughtful and witty comment. I agree that there is room for a lot of anthropological innovation when it comes to interpreting ancient societies, especially for the Minoans. The Minoans are tricky to analyze in many instances, since we can’t read their texts. (But the lack of written evidence hasn’t stopped anthropologists from reassessing prehistoric art in recent years; McCoid and McDermott came up with a ground-breaking argument regarding the prehistoric “Venus” figurines, in which they argue that these statuettes were made by women looking at their own bodies). I haven’t read the Roy Rappaport article, but I look forward to reading it. That argument about protein sounds interesting. Although I think that McInerney’s word choice of “somewhat tenuous mastery” might not be the best, I can see how one would believe that Minoans found themselves subordinate to or dependent upon the power that is embodied in nature. That being said, I am open to new interpretations that will come along. 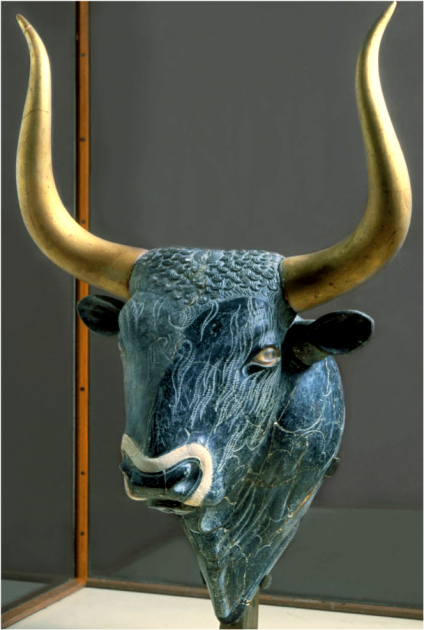 One reason I love Minoan art is that there is a lot of room for new interpretations and ideas.